$5 from your purchase goes to helping protect endangered rhinos. Invite this rhino to join you for coffee and help save their species. 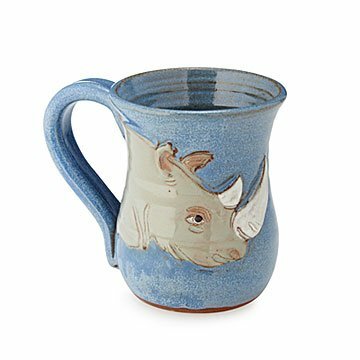 Poaching is a constant threat to these beautiful beasts—some for status, some for the horn's (non-existent) medicinal properties—and so JoAnn Stratakos created this custom mug. $5 from every purchase goes to PARCA (PA Rhino Conservation Advocates), an organization in her home state that educates the public about rhino conservation and raises funds for on-the-ground efforts to save them. Handmade in Pennsylvania. I wish this came in every animal! It was a gift for my son, whose favorite animal is the rhino. All the other mugs I looked at looked cheesy or cartoonish. I bought this gift along with the elephant mug as a birthday gift for someone who loves animals. Was very pleased with the quality and size of the mugs.And I loved that a portion of the proceeds goes to conservation causes. My one recommendation would be that a card be included in the box that references the conservation group that was donated to. My friend doesn't drink a ton of hot drinks, but says it does a nice job keeping cold things cold if that's helpful. This mug is beautifully crafted and holds a generous amount of coffee or tea. Also part of purchase price goes toward saving rhinos in the wild.